Podcasting is a fun and effective way to share information and connect with your audience. According to the Pew Research Center, the percentage of Americans who have “listened to a podcast in the past month” doubled from 2008 to 2015. Individuals and companies of all sorts are getting involved and creating their own podcasts – some are talking about their interests, while others are focusing on talking to their clients and passing on valuable advice and resources. If you’re already serious about podcasting and want to develop your skills, this article can serve as a valuable resource. I will go into the three top strategies that will help you overcome some of the most common challenges faced by new podcasters. Start off on the right foot by planning your podcast in detail. Checklists are extremely useful because they help you complete tasks in logical order and avoid missing key points during the planning process. The two main checklists you should consider using are a show preparation and an editing/publishing checklist. In this list, you outline a logical structure for each episode. This will include the activities you need to complete before you start recording e.g. key areas of research, and the topics you’ll want to cover while you’re recording your podcast. If you’re interviewing someone on your podcast, then this document is also a great place to to list key questions you want to ask during the interview. By creating this list, it will become clear if you need to fill in any gaps, and you won’t get caught short of content while you’re actually producing the show. This checklist is especially important for when you start out podcasting. 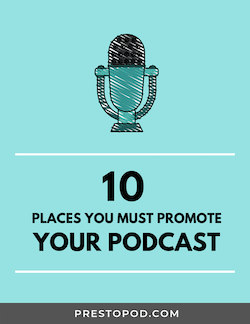 But it will also prove invaluable as you become a more experienced podcaster. It takes time to edit and publish a podcast, so you want to make sure you follow a well defined routine and don’t leave anything out and risk having to start over. Though every podcaster will have a different list, there are a few essentials that should be included. Firstly, you should make a copy of the original recording. Backups are essential as you don’t want to lose your entire podcast after all your hard work. You should also fix noises, balance sound levels and ensure your final audio file is normalized for the right loudness. This will enable you to deliver a better listening experience for your audience. And it’s also the kindest thing to do for your listeners’ ears! If you’re considering producing a regular show, you should employ a batch processing methodology. This means that you should group similar tasks, such as recording and editing, in order to streamline their completion. Follow the same routine each month – schedule a specific time in your calendar to research and prepare for your recordings – and stick to it. Try to carve out enough time at the beginning of the month to research two, or even four, of your podcasts in one sitting. This will help you link your recordings together seamlessly and will enable you to plan your month ahead far more easily. It’s also a good idea to record your podcasts back-to-back (perhaps over the course of two or three days), and then edit them all at the same time. Repetition of the same tasks helps with efficiency. If you’re unable to record in one go, at least make sure to record a few days before you publish, to allow ample time for editing and ironing out the kinks. This will also give you the chance to re-record a section if necessary. Podcasting takes practice, so producing content regularly is more important than being perfect with each episode. Whether you’re recording one episode a week or eight episodes a week like John Lee Dumas, batching your recordings will improve your productivity. Content is the most important thing, but decent hardware helps make your podcasts stand out as well. Crackly, quiet, or unclear recordings can deter your listeners and make them unlikely to tune back in again – no matter how good a host you are. With all the hardware options out there now, you can easily find yourself spending a lot of money on microphones, pop filters, XLR connections, mixers, stands and so on. The good news is that these days you can get good equipment at a reasonable cost. First, look for a decent microphone. The prices range from around $20 to well over $300. You might want to start out on the low end if you’re still just starting out. The Audio Technica ATR2100 at around $70 is a great entry-level microphone. But, if you’re more serious, you may want to consider, a Heil PR40, a popular high-end microphone which costs around $350. .
Mixers are also useful tools to help you balance the sound. If you have a guest, for example, you can place one voice slightly to the left, and the other slightly to the right. It’s relatively simple to balance treble and bass, and the relative volume of the microphones, and it makes a world of difference in creating a professional, conversational tone that’s easy to listen to. Again, you don’t need to break the bank. I recommend trying out a good entry level USB multi-channel mixer like the Behringer Xenyx 802, a great entry-level mixer, which will set you back $60 or consider a more higher end mixer like the Alesis Multimix 8 for around $150. But in most cases, if your co-host or guests will be in a different location than you, then you most likely don’t even need a mixer. Just plug your USB microphone into your computer and use Ecamm Call Recorder or Pamela software to record your Skype calls. Even though it’s important, there is no need to obsess over your hardware. Rather than spending weeks researching the options and comparing and collecting information in spreadsheets, it’s more important to just get started. You can always upgrade later on. With these three strategies in mind, you’re well on your way to overcoming some of the key challenges faced by many new podcasters. My final piece of advice is to get going and to stick with it. The more you practice the better you will get – and podcasting can be an extremely rewarding experience, both personally and professionally.